Welcome to The Ultimate Fluff Stash Giveaway hosted by Daily Mothering and sponsored by Kebbie’s Diaper Bag! We are giving away a huge cloth diaper prize pack valued at over $600 to one lucky winner! For a total retail value of $634.40! Winner chooses colors and prints! 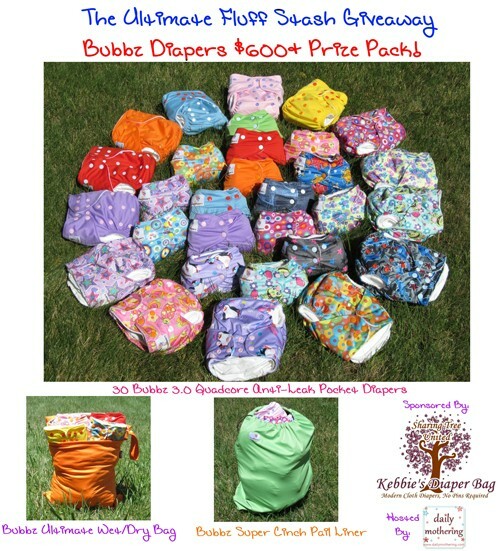 Haven’t heard of Bubbz 3.0 Cloth Diapers? These new one-size cloth diapers from Kebbie’s Diaper Bag feature a waterproof TPU outer, super soft microfleece inner, color coded waist snaps, four rows of rise snaps, dual pockets, extra gentle leg gussets, and a Quadcore Anti-Leak Protection System complete with twin gussets, a back pocket gusset, and a front waterproof flap. Each diaper comes with 2 Deluxe Organic Bamboo Cotton Inserts for superior absorption. The inserts snap onto the diaper, and they can either be stuffed inside the dual pocket opening for a stay-dry feel or laid on top of the diaper against your baby’s skin for a soft natural fiber layer. Read the Bubbz 3.0 diaper review at Daily Mothering for more details and pictures! ← We Are Designing a Nursery!